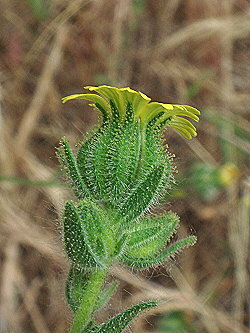 Madia gracilis excretes a sticky substance that is attractive to various pollinators, allowing plant comes into contact with multiple various arthropods throughout its lifetime (Turner 2013). In an attempt to combat the herbivores that feed on it, the plant uses the same sticky substance that attracts the insects to the plant in the first place to trap it. The sticky substance on the bulb is similar to the bulb of the poppy plant, but without the major chemical properties that make the poppy plant one of the most controversial plants on the planet. Once trapped, other predatory arthropods, like a grasshopper, are able to feed on the insects that were trapped, creating a relationship that both helps the plant and the insects (Krimmel and Pearse 2013). While some arthropods feed on the plant, some work with it to create a more mutualistic relationship. The presence of pollinators in the ecosystem begin to make sense of the cost- benefit ratio that the plant has with creating many floral leaves. While it is very costly to create many floral leaves, pollinators like the bumble bee and other butterflys are attracted to the plants with the most brightly colored leaves, making its rate of reproduction higher. While in the absence of these pollinators, the plants with more floral leaves were not as fit to that environment, thus emphasizing the importance of the mutualistic relationship with the pollinators (Celedón-Neghme 2006). The seeds of the M. gracilis are very nutritious and are fed upon by numerous grassland species, such as birds, rabbits and other small mammals. Along with animals, native people living within the growth range of the plant have utilized the vast nutritious value of these seeds, with some native tribes using the seed as a staple of their regular diet (Sonoma 2013, Ross 2012). Other native plants such as the Salmonberry have been utilized in the diets of Native Americans for centuries. M. gracilis, as well as other plants, is a primary producer and is located at the bottom of the food chain in its ecosystem. It is able to coexist with other shrubs and herbs in the same forest or prairie environment without harming them or relying on them for nutrients (Evens et al. 2004). Other types of weeds, like the dandelion, can also live in these types of environments. The only type of competition exhibited by the plant is the need for sunlight, which in some cases it must compete with very large trees like the giant Redwood trees in California, but the other types of brush and herbs in the same ecosystems do not pose a major threat to this problem.